Since the late 1980s, there has been a growing interest in the use of foundational ontologies to provide a sound theoretical basis for the discipline of conceptual modeling. This has led to the development of ontology-based conceptual modeling techniques whose modeling primitives reflect the conceptual categories defined in a foundational ontology. The ontology-based conceptual modeling language OntoUML, for example, incorporates the distinctions underlying the taxonomy of types in the Unified Foundational Ontology (UFO) (e.g., kinds, phases, roles, mixins etc.). This approach has focused so far on the support to types whose instances are individuals in the subject domain, with no provision for types of types (or categories of categories). In this paper we address this limitation by extending the Unified Foundational Ontology with the MLT multi-level theory. 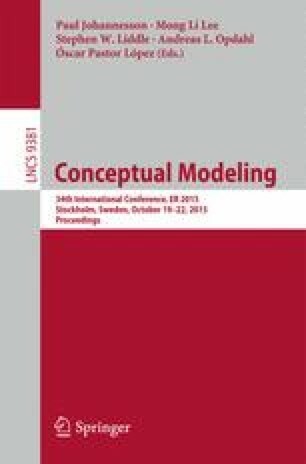 The UFO-MLT combination serves as a foundation for conceptual models that can benefit from the ontological distinctions of UFO as well as MLT’s basic concepts and patterns for multi-level modeling. We discuss the impact of the extended foundation to multi-level conceptual modeling. This research is funded by the Brazilian Research Funding Agencies CNPq (grants number 311313/2014-0, 485368/2013-7 and 461777/2014-2) and CAPES/CNPq (402991/2012-5). Victorio A. Carvalho is funded by CAPES.